Was the Oregon mass shooting an Islamist attempt to assassinate Alek Skarlatos? Was last week’s massacre at Umpqua Community College in Oregon a failed attempt to assassinate a Christian American hero for thwarting a Muslim terrorist train attack this summer in France? There may simply be a series of unlikely coincidences at play, or there may be circumstantial evidence suggesting that anti-jihadist hero Alek Skarlatos was an intended target of Chris Harper-Mercer, who put several Christians to death in an Umpqua classroom on Thursday, Oct. 1 for being Christian. Read on and decide for yourself if Harper-Mercer may have wanted to make an example of Skarlatos for the world to see. And although no evidence revealed thus far directly indicates Harper-Mercer was influenced by Islamic State, plenty of evidence suggests the shooter was acting in furtherance of the Islamic goal of global jihad. Maybe the massacre was intended as a kind of jihadist payback hit. Islamic State (a.k.a. ISIS, ISIL, and Daesh) apparently claimed responsibility on Twitter for the killings Harper-Mercer carried out at Umpqua. The tweet states, “Again #Oregon #USA #WashingtonDC #IslamicState #ISIS #USA[,]” and displays a graphic with the words “Slay Americans” in front of an image of a man in the process of being beheaded. In August the very high-profile Skarlatos, a devout Christian, helped to disarm Ayoub El-Khazzani, a Moroccan with ties to radical Islam, on a high-speed train traveling from Amsterdam to Paris. The Islamist was armed with a Kalashnikov rifle, a Luger pistol, and a box cutter. Skarlatos and his two American friends traveling with him received France’s highest honor, the Legion d’Honneur, from French President François Hollande. Last month they were feted at the White House and the Pentagon. Skarlatos received the U.S. Army’s Soldier’s Medal. Skarlatos has publicly acknowledged that he is currently a student at Umpqua, near Roseburg, Ore., and that he was supposed to be attending classes there on Thursday when Harper-Mercer went on a bloody rampage. More specifically, Skarlatos said he was supposed to be present that day in Snyder Hall, the same building where Harper-Mercer carried out his massacre. In a taped interview with Ellen DeGeneres on Thursday, Skarlatos said he was supposed to be in the building where Thursday’s shooting took place. As a famous American and Christian who prevented what could have been a high-casualty terrorist attack in France — one of the few Western nations that over the objections of President Obama is actually trying to do something about the Islamist peril — Skarlatos would have been an attractive target for Islamists. 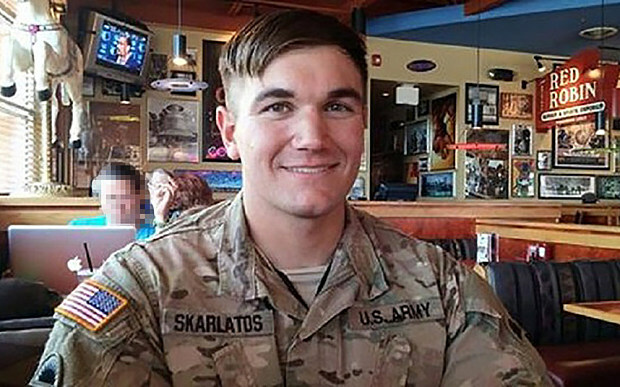 Because America and much of the world holds Skarlatos up as a symbol of heroic Western resolve to defeat Islamism, those who support Muslim expansionism view him as an enemy. There are very few people on the planet who would be a more valuable target than Skarlatos. Islamists view not only Skarlatos, but also his two childhood friends who helped to foil the train attack, as enemies. The three young men have been widely identified in news reports as fervent Christians. Skarlatos attended “an independent Christian middle school,” the Sacramento Bee reported. Which brings us to Harper-Mercer, 26 (his age was initially reported as 20) who killed 10 people and wounded seven at Umpqua Community College last Thursday before being killed by police. Witnesses said that Harper-Mercer wore body armor and entered a classroom where an English and writing class was being conducted. He demanded that those present say if they were Christian. Those who said yes were fatally shot in the head. He reportedly said “because you’re a Christian, you’re going to see God in just about one second.” Those who said no or refused to answer were shot in the legs. No news reports indicate anyone in Snyder Hall identified himself or herself as Muslim. Singling out Christian hostages for death is the same modus operandi used by Islamic terrorist groups like al Qaeda-linked Al Shabaab. For the record, there is a precedent here: Whenever Islamic terrorists raid large centers where Muslims and Christians are intermingled, they routinely separate Muslims from Christians, before massacring the latter. For example, last April in Kenya, gunmen from the Somali Islamic group, Al Shabaab—“the youth”—stormed Garissa University, singled out Christian students, and murdered them, some beheaded. June 15, 2014: Approximately 50 militants from Al Shabaab went on a killing spree in Mpeketoni, a predominantly Christian town on Kenya’s coast. They chanted “Allahu Akbar,” killed whoever could not recite verses from the Koran, and went door-to-door asking residents their religion, killing those who answered “Christian.” More than 57 people were killed, including six children of church pastors. August 24, 2014: Al Shabaab abducted a group of traders near the island of Lamu. The militants eventually released three of them, because they were Muslims, but beheaded the fourth, a Christian. November 22, 2014: Al Shabaab attacked a bus and massacred 28 of its Christian passengers. Again, Muslim passengers were separated and left unharmed. December 2, 2014: Al Shabaab gunmen launched an early morning raid on quarry workers sleeping in their worksite tents near the city of Mandera, along the Somali border. Christians and Muslims were separated before the Christians, thirty-six of them, were beheaded or shot dead. Harper-Mercer has been identified in news reports as emotionally disturbed and as anti-organized religion or an atheist. Mercer’s MySpace [page] features only two connections, one of which is a man named Mahmoud Ali Ehsani. Ehsani published a photo album titled, “Classic – The Mujahideen Collection LOL,” featuring Islamic terrorists from several countries, including Palestine, Iran, and Pakistan, among others. Mercer wrote on a dating profile he disliked “organized religion,” and considered himself “spiritual” instead of religious. He also described himself as a “teetotaler” and said he “never” did drugs. At first glance the IRA connection may seem irrelevant but it’s not. The IRA has a long history of cooperating with the Palestine Liberation Organization (PLO) and other Islamist groups. No writings by Harper-Mercer revealing an explicit, stated animus towards Jews have yet surfaced but given what we know so far about his beliefs, it is difficult to imagine him having warm feelings for Jewish people. This young man, who had no job and presumably little money, plunked down close to $150 online for SS headwear. The fanatical SS, or Schultzstaffel, was an elite Praetorian Guard-like organization within the Third Reich that led Hitler’s “Final Solution” against the Jews and other hated groups. The leader of the SS, Reichsfuehrer-SS Heinrich Himmler, told SS officers in a 1943 speech that killing Jews, whom he characterized as a pathogen, was necessary for the health of the Nazi state. Identifying himself with the user name, ironcross45, Harper-Mercer ordered a pricey leather Nazi SS officer’s cap from the website iOffer, and praised the site for its excellent “customer service.” The stated price was 98.34 British pounds, which was equivalent to US$149.01 at time of writing. On a dating site Harper-Mercer used the same username, ironcross45, apparently a reference to a German military honor, the Independent (UK) reports. Long before he seized power in Germany, Hitler served as a lance corporal in the German Imperial Army during World War One. He received the Iron Cross, Second Class, in 1915, and the Iron Cross, First Class in 1918 for his military service in the Great War. It is worth noting that the very first person to die at Harper-Mercer’s hands Thursday was Jewish. The gunman reportedly walked up to Assistant Professor Lawrence “Larry” Levine and said “I’ve been waiting to do this for years.” He then shot Levine at close range. … gave a bunch of papers and a thumb drive to someone on campus, multiple sources told ABC News. They contain hate-filled writings and material, with the information on the thumb drive found to be more extensive, they said. The messages in the papers and thumb drive that the suspect left behind can be described as espousing racial and social hatred, one source added. Even though Harper-Mercer was half-black himself, black men are reportedly singled out in the rants on the thumb drive. Are rants against Jews also on the drive? We’ll have to wait to find out what if anything this collector of expensive Nazi paraphernalia had to say about Jewish people. Although you won’t hear it from the mainstream media, Nazis and Islamists have much in common. It is fair to say that Islamic terrorists are the last of Hitler’s World War Two coalition partners that have yet to be vanquished. Many Muslims fought on the German side during World War II. The Wehrmacht had six legions with a Muslim majority and the SS had three Muslim divisions, a brigade and a Waffenbrigade. Each Muslim unit got a mullah as an adviser. In November 1944, an SS mullah school was established in Dresden, founded by Himmler. So many Muslims volunteered to fight for Nazi Germany that in 1943 Hitler gave them their own division, known as the 13th Waffen Mountain Division of the SS Handschar (1st Croatian). Handschar means sword in English and in this case refers to the scimitar, a curved sword associated in Arab and other cultures with Islam. A scimitar appears in the flag of Yemen. Two crossed scimitars appear in the Pakistani Army’s flag and in the Saudi war flag and in some jihadist flags. A straight stylized version of a scimitar appears in the Saudi national flag but a curved scimitar appeared in a previously version of the same flag. Harper-Mercer’s enthusiasm for Nazis and the killing of Christians is something he shares with the Islamofascist terrorists now wreaking havoc in the Middle East and around the world. As anyone who follows the news knows, Islamic State fighters delight in torturing and killing Christians because they are Christians. Although it would be an understatement to say that Hitler’s views on world religions were complex and at times seemingly contradictory, the leader of the “Thousand-Year Reich” that lasted 12 years despised Christianity and admired Islam and its militarism. Hitler said nice things about Christianity in public, but excoriated it in private. “Christianity is the prototype of Bolshevism: the mobilization by the Jew of the masses of slaves with the object of undermining society,” Hitler reportedly said in 1941. Although some dispute whether Hitler ever said such a thing, it cannot be denied that in the Third Reich the Nazi Party treated the Christian church as something to be bent and twisted to serve National Socialist goals. A movement called “Positive Christianity” was promoted to co-opt the church and inject it with Nazi ideology, including the party’s belief in the importance of racial purity. The name itself implies that Christianity is bad. Official Nazi ideologist Alfred Rosenberg referred to Roman Catholicism and Protestantism as “negative Christianity.” He sought to whitewash Christianity’s connection to Judaism and “substitute the spirit of the [German Nordic] hero for that of the Crucifixion.” And Hitler, as stated above, liked Islam enough to welcome Muslims into the Axis alliance. Harper-Mercer’s murderous actions show that he shared Hitler’s contempt for Christianity. This unemployed loser who bought overpriced Nazi paraphernalia may also have resented Skarlatos for all the attention he received. So the question then arises, why in his televised address Thursday before many facts were publicly released, did President Obama take it upon himself to lecture the nation on the urgent need for more gun control? Instead of comforting Americans and bringing them together as a decent, patriotic person would, Obama immediately seized on the opportunity to divide Americans politically. Obama said nothing about the religious aspect of the killings. This self-professed Christian who studied in a Muslim school and speaks of Islam in reverent tones said nothing about how the killer asked his victims jihadist-style if they were Christian and then blew them away. Why would the president ignore this shocking fact? Maybe the answer is that to do so would have linked the killer to Islam. Maybe President Obama knows more about the martyring of Christians at Umpqua Community College than he’s letting on.